Although i do a lot of time cycles but they may not work well all the time but over the last few years such analysis has given some really good insights. The last update was in November 2009 calling a major bottom in place. Previous updates were way back in Sept and December 2008 and subsequently March 2009. Most of the time analysis has given good turnaround points. check the above post for detailed analysis. Let us look at the major time wise drops in the cycle since 1992. -> Most of them generally taken a 13-16 months to form a major bottom or an intermediate bottoms. 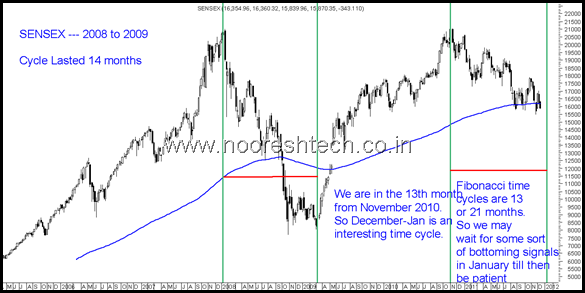 -> The last major cycle was from 2008 to 2009 which took around 14 months. -> The longest cycle was during 1990s but after 16 months it gave a bounce of 40-45% from the lows. -> The next such long cycle was in 2000-2003 took around 38 months but after 19-20 months it gave a bounce of 40-45% from the lows. -> The current cycle is already in the 13 months so next 1-3 months will be an interesting time period for a major bottom or an intermediate bottom. -> On fibonacci front we generally see a cycle of around 8/13/21 months. If this is a 13 month cycle then we might be nearing an important time period but we may also see it to be a 21 month cycle so next time period would come around Sept-October next year. -> We have almost taken a similar time like 2008-2009 but the fall has not been as sharp indicating its a corrective cycle rather then a bear market. Although as of now have not looked into the price projections and possible fundamental projections so we will keep these post as Part 1 which will be later updated. Ever since 19900/19000 has broken we have had a very cautious stance with a view to stay on high cash and look only for short term trading opportunities on either side. Although since August 26 we have indicated it to be a time to buy on sharp declines but still the focus has been on defensive value bets ( some of them discussed extensively – ( Godrej Inds, Aditya Birla Nuvo, Nesco , Smartlink ) and the search continues for more of such picks with lots of research. Fortunately the above stocks have been pretty resilient in terms of the crash in midcaps. With 8-10% returns on Fixed Income Instruments it obviously does not make sense for Retail Investors to get into equity unless their outlook is beyond 1 year or more. At the same time we generally see attractive valuations in such time periods and the best returns are seen after investing in such periods. Mind you in this period quite a lot of stocks will look cheap and keep getting cheaper so one needs to be very careful in buying. One of the simplest mistakes is to buy 52 week lows or stocks which have dropped 50% !! and get stuck. Also Blue Chips do not imply they will always remain Blue :). One of the only blue chips which we look interested in is SBI on dips to 1650-1500 or lower or one may buy slowly. Also the best research is done in this period as people start calculating the worst case scenario , factor in de-growth , liquidation value, dividend yield and all sorts of conservative approach. So although i would not suggest to start buying heavily but definitely suggest HEAVY RESEARCH and HOME WORK. One may even look at Bonds for fixed return plus some capital gain ( i have not much idea on this ). 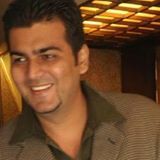 Above all i would strictly suggest people to wait for some time before getting into Gold as an investment. Will review this post with Price and Fundamental Projections or in January !! Disclosure: I generally tend to have a bullish bias and an optimist. My personal view is 13000/14500 is a worst case scenario for the index on closing basis. More i hear about the World ending, Euro crash, Dow 4000 and so on it increases conviction in the long term trend of Indian markets.